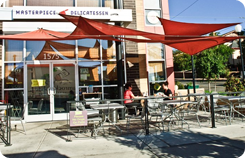 This fabulously delicious deli may have opened its doors in 2008, but with the sudden and constant growth and popularity of the LoHi and Riverfront neighborhoods, we feel that this artful sandwich shop deserves a place on the list as one of Denver’s hot new spots. Masterpiece Delicatessen in Denver takes a classic, comfort food and makes it all their own, with a menu to die for and a line that seems to wrap around the block. If you have ever ventured across the white Highlands Bridge and landed on the LoHi side, you were face-to-face with Masterpiece Delicatessen in Denver’s front door. It is located on a prime block along Central Boulevard and has unmatched views of downtown and the mountains. A lovely terrace with plenty of seating is ideal for people-watching or simply enjoying a cup of coffee in the morning sun. 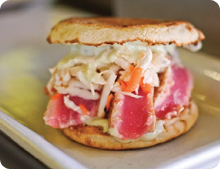 But the real magic happens inside and comes in the form of artisan sandwiches. When eating out in Denver, it doesn’t matter if you are in the mood for a classic Cuban or an adventurous White Truffle Egg Salad, as everything is served to perfection with the best ingredients, on home-made bread, and is sure to please every appetite. Those looking for a healthier option can opt for freshly made salads, soups, or fruit on the side. Masterpiece Delicatessen in Denver even has something for those who enjoy breakfast at night: with gourmet breakfast sandwiches served all day. And if you are simply looking to enjoy a spring evening out in LoHi, this deli does not disappoint when it comes to cocktails; as all drinks are doubles, the beer and wine are local, and the happy hour last for hours every day. This small, deliciously crafted restaurant likes to stick to its Colorado culinary roots, from the wild mushrooms available on any sandwich to the locally brewed selection of beers. Owners Steve Allee and Justin Brunson left everything on the table when they left their fine dining careers to open up a gourmet deli that everyone could afford. And we must say, this fast casual, culinary treat definitely beats some fancier restaurants as one of Denver’s hot new spots. So take a walk through LoHi, check out this up and coming neighborhood, and stop by Masterpiece Delicatessen in Denver for some of the best sandwiches in town!